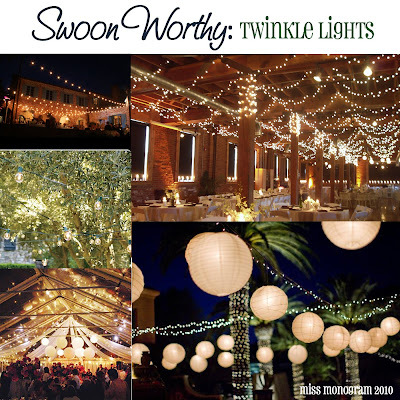 I love twinkle lights! The place we're getting married has an outdoor patio garden with lanterns and twinkle lights on the trees. It's one of the things that made me fall in love with the place. That and the views! I can see why you are so inspired to use the lights. It does cause a simple romantic effect doesn't it? How lovely- I'm sure they'll add the perfect touch to your wedding reception! do you know any good websites to order the lanterns from? i *sparkle heart* twinkle lights. so absofreekingloutely beautiful! Love the twinkly lights!! Dr. Chick and I recently went to an outdoor wedding with tons of these, it was beautiful!! So cool.. I love twinkle lights at weddings! Hope you're having a fabulous weekend! P.S. I'm having a giveaway you should check out!